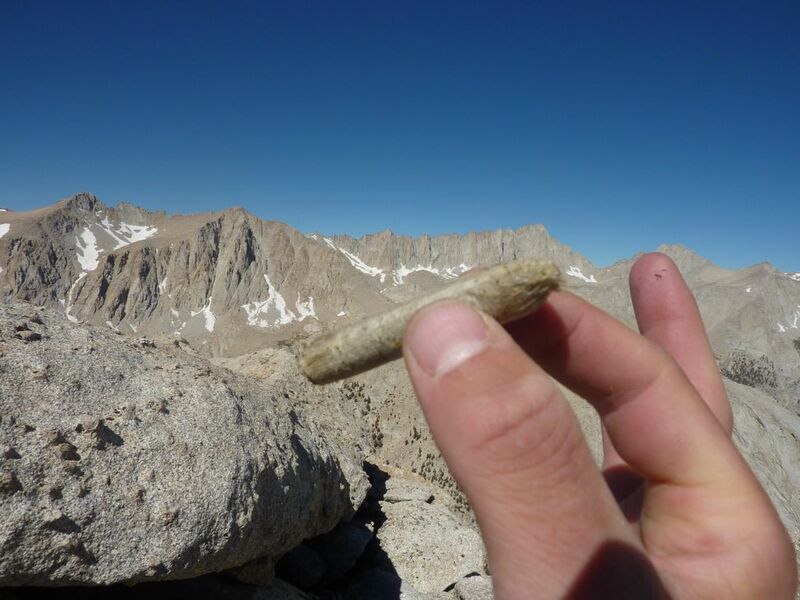 When I did Lone Pine Peak earlier this summer, I had limited time and information, and settled for the easy talus-slog route. 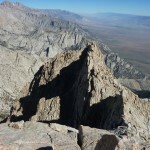 This time, I found myself in Lone Pine with more information, and decided to do the classic North Ridge, one of two ridges for which the peak is popular. 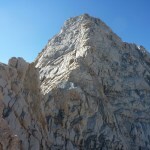 While it can be done from the valley up, the interesting climbing seems to be concentrated in the upper ridge, so the most popular way to climb it is via the Meysan Lakes trail. 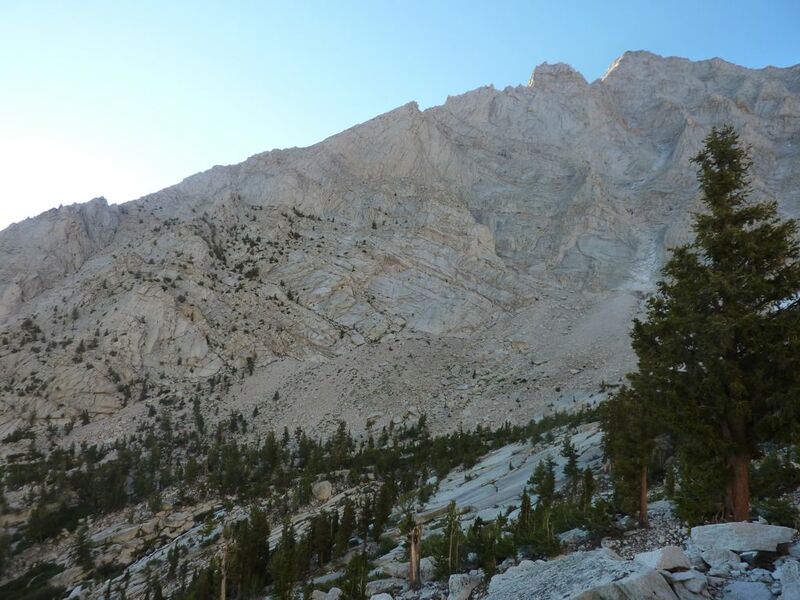 I hardly needed to start as early as 6:10, but with highs in Lone Pine close to 100 degrees, the east-facing Meysan Lakes trail is brutally hot. 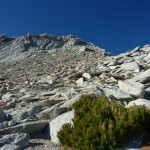 Despite doing very little the day before, I was feeling a bit dead as I trudged up to the cutoff for the ridge. The route description says to leave the trail at Lower Meysan Lake, which, as far as I can tell, doesn’t exist. I left it where it heads toward the stream and (infuriatingly) downhill in some woods, crossed the stream without issues, and soon found boot-prints and some ducks heading up class 2 terrain with a few trees toward the ridge. Clearly, I was on the right route to something. 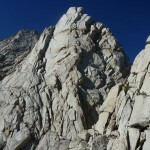 I reached the ridge expecting narrow, exposed granite, and was disappointed to find a broad face of standard southern Sierra sand and rock. 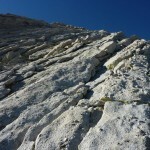 Eventually, this steepened and became a romp up class 2-3 slabs, which was more fun, but again not what I had in mind. 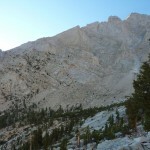 I continued cruising the east side of the ridge in my running shoes, bypassing what I think was the “first tower” in the gap between the ridge and a huge standing slab. Maybe I was “cheating” by staying too low; I climbed up to the ridge to see what else I could find. The climbing became more consistently class 3 with bits of class 4, but it was still running-shoes terrain, a mixture of moderate-angle slabs and vertical flakes with plenty of holds and foot jams. Route-finding slowed me down somewhat, but there was still a sad lack of 5.5. Then I reached what I think was the “second tower.” It looked like I could drop down the left side and climb up some cracks, but I decided to see what I could find to the right. Things when decidedly 4th class, then 5.easy, with fewer route options. 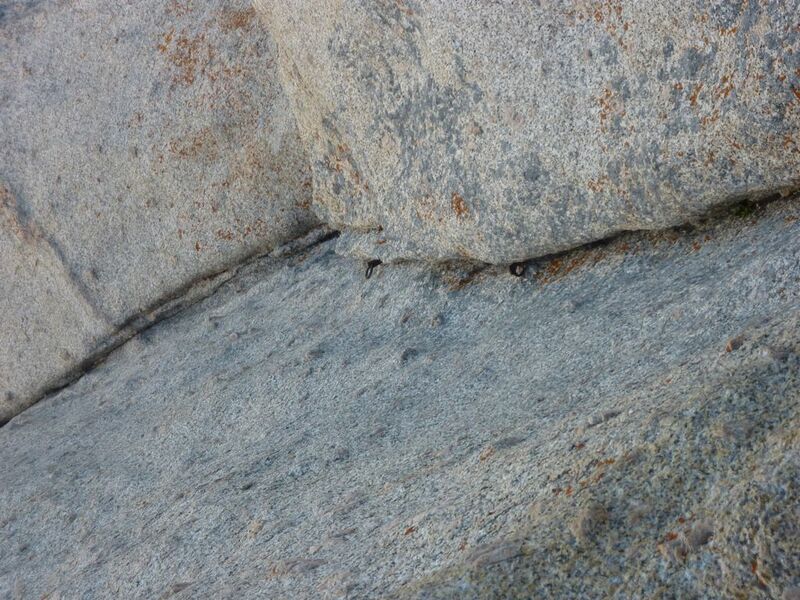 I found a zig-zag line of lower-angle rock with plenty of edges and (hopefully) cracks, and headed on up. After some more 5.easy, I saw that my intended line required crossing a slab that looked a bit too 5.makes-you-think for running shoes. 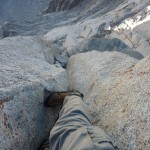 One bout of more-or-less secure writhing later, I was on more comfortable 4th class terrain. Passing a couple of tent platforms, I reached a horizontal spur on the northwest side of the ridge, and was back on cruiser terrain. From there, I stayed on top of the main ridge, which was exposed but mostly just a walk, then dropped into the gap before the summit headwall. After exploring a sloping slab to the right, and finding it not at all to my liking, I headed down the left gully until it was possible to exit onto that side of the ridge. I collected a quickdraw, a biner, and a sling on the way, more than making up for the bail biner I left in the Alabama Hills the day before. I also found a handkerchief, but decided to let it lie. 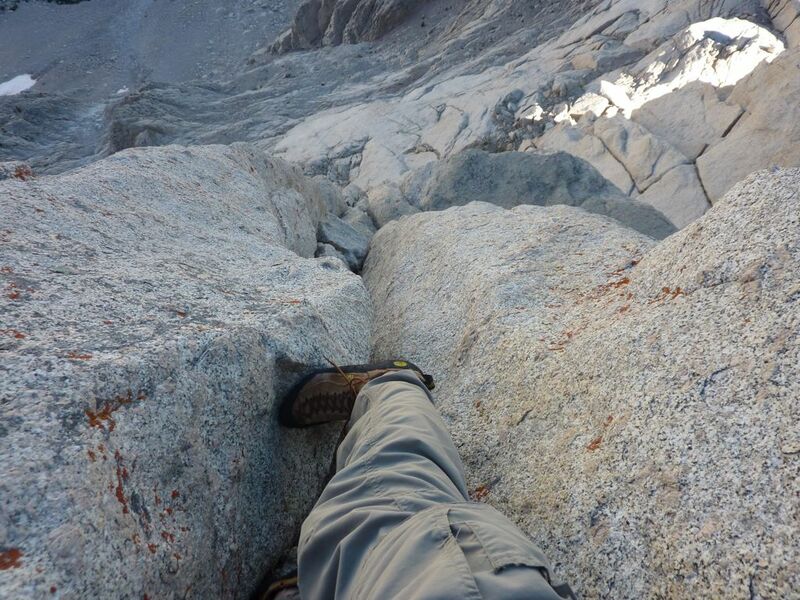 The rest of the climb was more class 3-4 slabs, then some blocky talus near the top. 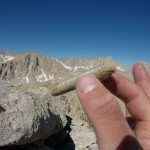 I tried to come out right on the summit, and only missed by about 20 feet, reaching the top 4 hours from the car. 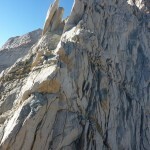 I snacked, aired out my feet, changed back into running shoes, and took off for my favorite scree chute. 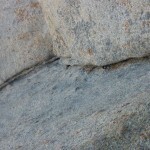 The recent storm that flooded Whitney Portal had rearranged the scree and carved a deep channel in the gully. 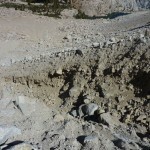 While this exposed some hard-pack, it also left great drifts of sand and pebbles, perfect for skiing. After emptying my shoes near Grass Lake, I took off at a moderate pace, but soon found myself pulled on by the prospect of reaching the trailhead in under 6 hours. I shortcut the heck out of the absurd switchbacks on slabs, pine needles, and sand, jogging or running where I could, and reached the car in 5h42. While the ridge was fun, it was not very sustained, and hardly the “classic” I had expected. Maybe I could have stayed closer to the crest lower down — it seems like the kind of ridge you can make as hard as you want by taking a more direct line — but that still leaves me a bit disappointed.